As a resonably old fart in the young mans world of BMX, for the first time in what seems like a decade, I’ve spent the last 9 months or so drastically changing my bike setup & attempting to learn new “modern” street moves. This has resulted in two new frame builds, along with bolting a 9t freecoaster onto my bike; something that as recently as a year ago I would have viewed as personally blasphemous, and something that one of my coworkers recently told me I was “too old” to do. While he may be somewhat correct (with over a decade of professional mechanical experience, I managed to ruin my brand new hub internals in 3 days), I’m still on the hunt for a setup that perfectly fits the feel I’m looking for, and if not for other life obligations preventing me for buying more bike parts, the Fit Savage frame would be high on my list of new rigs to build up. One of the first things I picked up on when researching the Fit Savage for this weeks column is that the Savage is not a “new” design for the brand; in fact, the Savage has been around for a few years now, which as a consumer, is a huge confidence builder, as it means they did something right & didn’t feel the need to create an “updated” version with a fractionally different head tube angle or a 3rd revision of removable brake mounts that you won’t be able to find in 6 months. The Savage is a stout (for 2017, anyway) street machine ridden by assorted members of the Fit team, and the current run includes signature colorways for Fit pros Ethan Corriere, Matt Nordstrom & Justin Spriet, which we’ll talk about in a minute. What personally stands out to me is the fact that the Savage is built for strength, using straight gauge tubing in all the right places (rear stays, downtube) and saving precious ounces where they’re not needed (top tube, seat tube) by incorporating doube-butted tubes. Other handy features include a double-gussetted front end, angled removable brake mounts for better stopping power, and integrated chain tensioners; my most recent frame is the first one I’ve owned with these, and I don’t think I can ever ride another bike without them. The other area where the Savage stands out to me is its geometry; my last 3 bikes have had slammed rear ends of 13.9″, 13.6″ and 13″, and the Savage hits my new theoretical sweet spot of 13.275″-13.6″, which speeds up manuals & spins while not being nearly as twitchy as bikes bordering the 13″ and under range. It also features a responsive 75.5 degree head tube, 11.8″ bottom bracket height to help with crooked & bottom bracket-incorporating grinds, and a 9.1″ standover height, meaning you won’t have to run as much seatpost to cruise the streets comfortably. 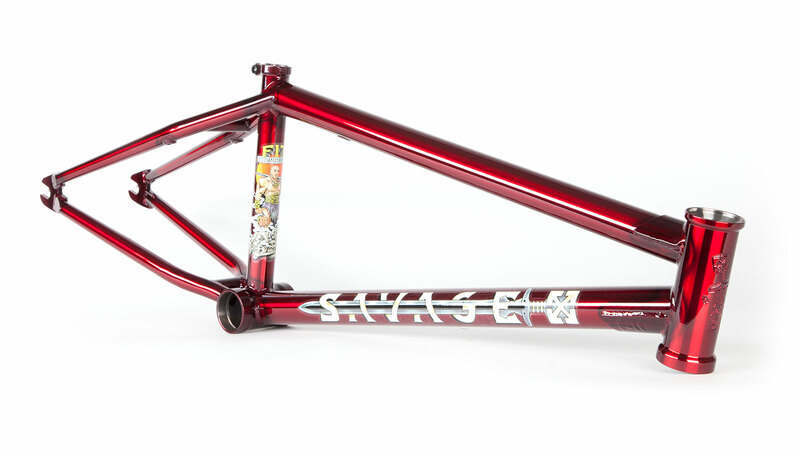 Fit’s Savage team frame is, of course, available now from Fit themselves and from all Fit Bike Company dealers. The Savage tips the scales at a few grams over 5lbs, and is available in both 20.75″ and 21″ top tube sizes. Getting back to those signature colorways, Ethan’s bike is trans red, Justin’s is trans smoke black, and Matt’s is trans purple, and not only does each model come with a personalized decal set, but each frame itself features its own specific, personalized, machined Fit logo, which is something that I haven’t seen anywhere else (editors note: I didn’t look anywhere else). The US-made Savage retails for $354.99, which isn’t the most economical option on the market, but how anyone can deny that it’s worth every penny is beyond me. For more on the 2017 lineup of Fit products, click this link to FitBikeCo.com now, and make sure to follow the brand on Instagram @fitbikeco.